Having explored all the nooks and crannies of the Old Town in Nice we passed some lovely fishermen’s cottages and made our way to the Colline du Chateau. 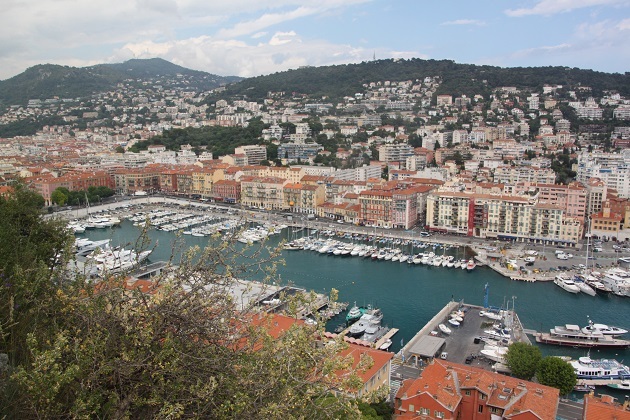 This is right at the eastern end of the Promenade des Anglais, once a fortified bastion but now (I read) the perfect place to see Nice from on high. 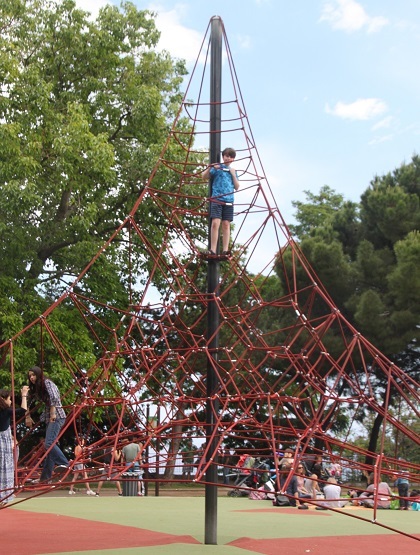 There is a (free) lift to the top – too good to resist for Son and me. Husband though decided the 300 plus step stomp was a better option for him. Coming out of the lift Son spied a park and was off. Having saved the energy on the steps he headed straight for a variety of climbing apparatus and proceeded to use it all up on that. Husband and I found a cafe, bagged ourselves a table and sipped our drinks in the late afternoon sunshine while Son climbed and clambered. Not much left of the ruined castle, just some crumbling walls but what you do get from up here is the most incredible view of the port. 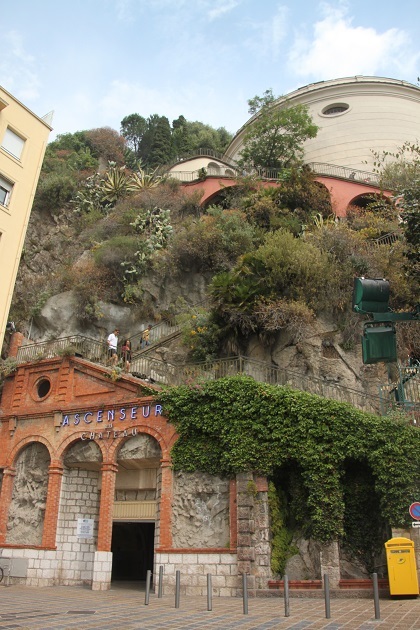 We took the steps on the way down – great views of the Promenade des Anglais and the city stretching out along the sea are too good to miss in the lift and going down is not so bad. 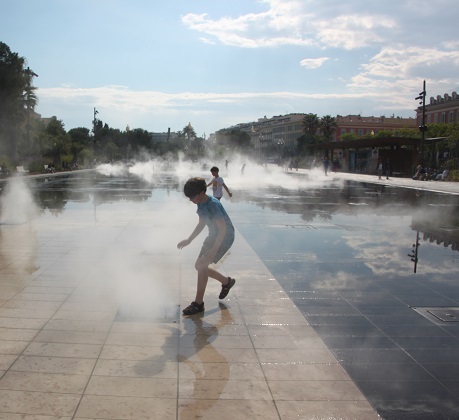 After that a quick dash through the city to the station to catch our train back to Cannes – just enough time for one last splash in the fountains at the Place Massena. The port photos are lovely! 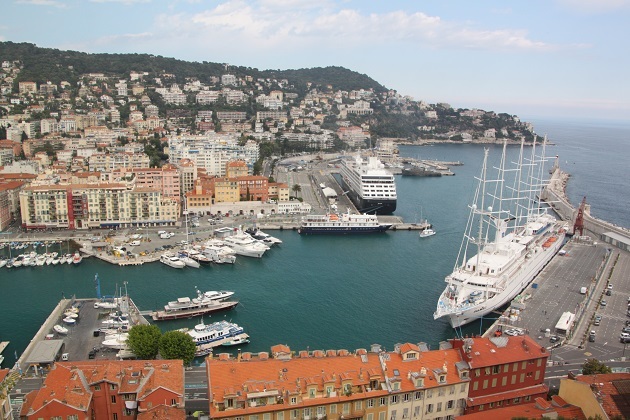 You get the most wonderful view of the port from up there – I was just blown away! 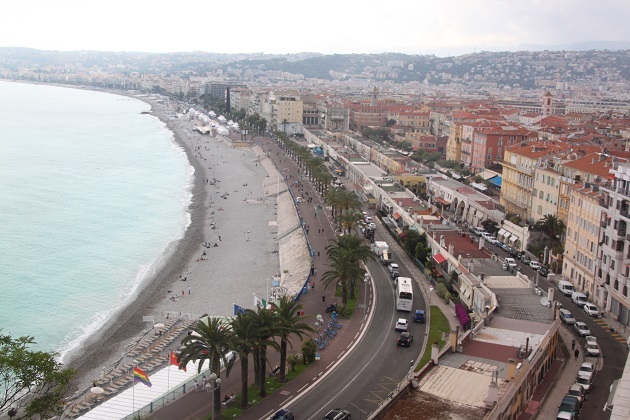 A great view to finish off your visit to Nice! Thanks for taking me back to some wonderful memories we had there! Thanks for coming along Pam! We loved Nice too, the views from up here were wonderful and were the perfect end to the day. Thank you – it’s a stunning spot so not hard to get some great photos. It is a gorgeous place Suzanne – the perfect views over the city. What a superb view! Definitely worth a journey in the lift. I’m not sure I would have climbed 300 steep stairs. I’ve done more in the past but would have needed a bigger pay off. Ha ha! Me too Laura, steps plus intense sunshine don’t do it for me, the lift was perfect and then walking down, well that was no problem!! I remember going there for the spectacular views but we didn’t notice a lift – definitely the best place for photographs! The lift was wonderful, it was so hot and this was right at the end of the day so very well received by us!! The views were just incredible, the perfect end to our day. The view of the port is quite incredible, you realise how big it is ! Absolutely and it looks so picturesque from on high!! Fantastic views! 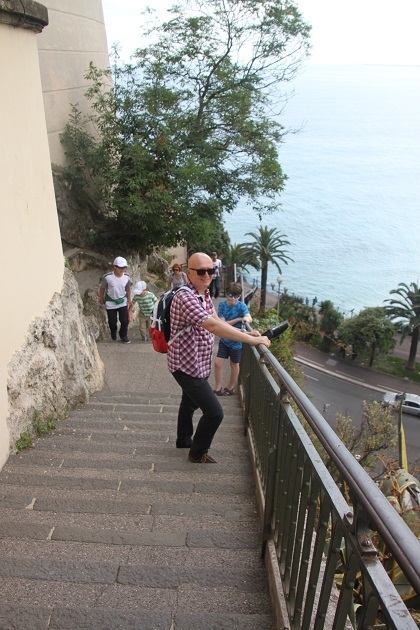 I might have gone for the steps – but the would have taken me a while. I usually take the steps and avoid lifts, however it was so hot and I thought with that, plus our Son’s moaning the lift was an easier option!! I was glad we walked down though, great views from the steps as well. That certainly is a great viewpoint! It’s fabulous – looking at the port and the promenade from up here was stunning. Beautiful views! I went to Nice some years ago, and the centre of the city was all torn up due to roadworks, so I didn’t enjoy it very much. It looks much nicer (ha!) now though! Good word use Jessica!! No roadworks when we were there so we saw it at its best – the views from up here were especially great. It was such a hot day Rosemary – that plus 300 steps and then the lift was free – you can’t argue with that!! 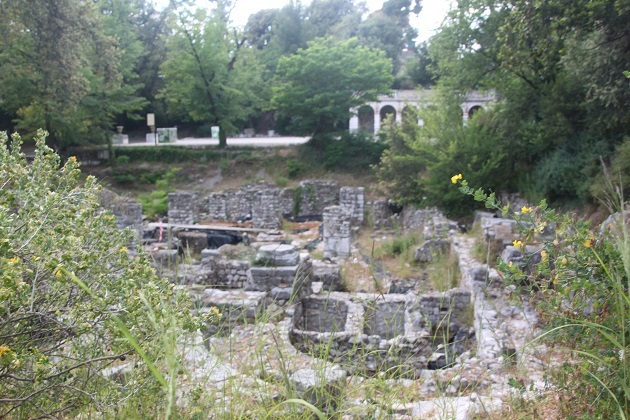 The views from the top were incredible and we got to see more as we walked down the steps – definitely the easier way!! Yes walking down is the way to go Joy! 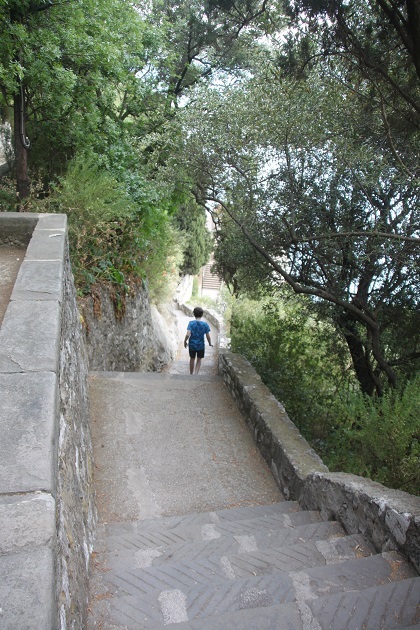 Better views as you say and I wouldn’t fancy 300 odd steps in the southern French heat either. I think it would be a similar summer heat to here as it’s a Mediterranean climate – we do get a really strong afternoon sea breeze, which is wonderful! Those views are stunning! Would definitely be worth taking the stairs up. But at this point in life, with a little one in tow, I always opt for the lift, too. It is gorgeous, the views are just amazing. 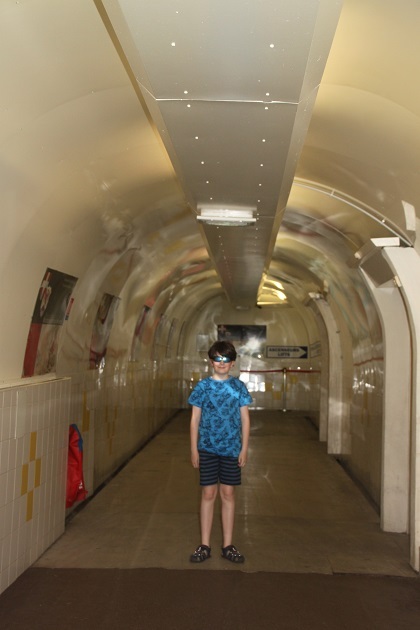 My son is not so little now and more than capable of racing up all those steps – the moaning though, that would have made it too much of an ordeal! !